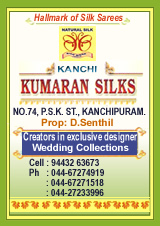 Kanchipuram is situated on the north-eastern coast of Tamil Nadu and it’s about 70 kms from Chennai in Tamil Nadu. 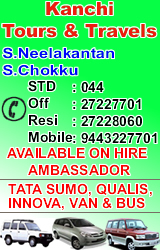 The nearest Airport is Chennai International Airport, 2 hrs drive away. 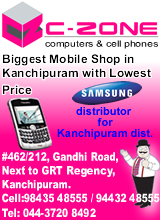 Kanchipuram is well connected by a network of roads to Chennai, Bangalore and other places. Kanchipuram is connected by train from Chennai, Chengalpattu, Tirupati, and Bangalore. Kanchipuram is also known as the religious capital of south India. Kanchipuram is one of the seven sacred cities of India. 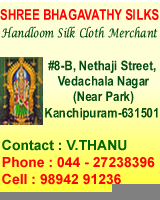 Kanchipuram is most famous for a large number of temples, exquisitely hand-woven silk fabrics and silk sarees. 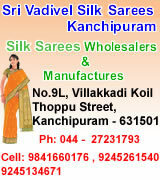 Kanchipuram silk sarees are exotic pieces of art, woven from pure mulberry silk. Available in a variety of designs, these sarees have vibrant colors and are decorated with fine gold thread. Any time in the year, but during first three months of the year city have a much cool pleasant climate which might suits more to foreign tourists. About Kanchipuram gets you all the details about Kanchipuram. 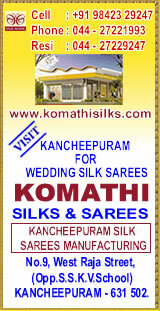 Kanchipuram is famous for temples and silk sarees. 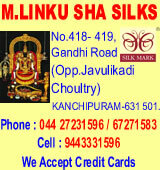 We are here to help you in knowing the information on temples, silk sarees, Tourist spot, Hotels, Marriage halls, etc. 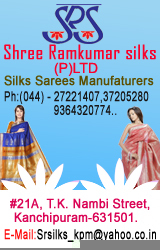 Here we guide you through all about the Silk city, Kanchipuram. 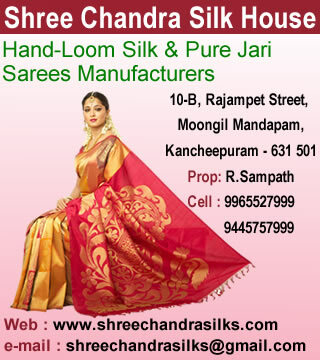 From very basic information for the tourist like best hotels in Kanchiuram, best Silk sarees shop in kanchipuram, the spots or temples to be visited are available here. 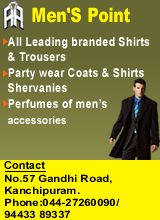 'About Kanchipuram' also have many articles on the most happenings in the city. 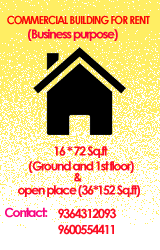 To experience the city virtually start roaming in our website. All the links in the sidebar will guide you. 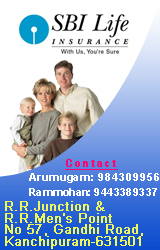 Wish you happy visit in our site!!! 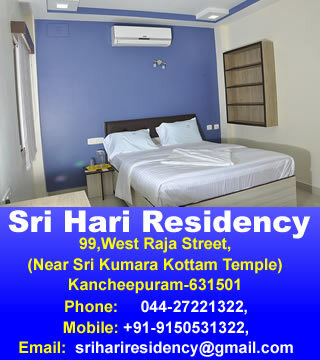 As Kanchipuram is a tourist Spot, Hotels in Kanchipuram have enough facilities that is competent enough to any hotel in any tourist spot. 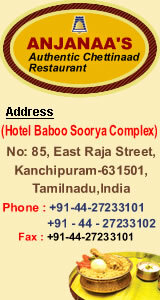 Let it be 3 star hotels in kanchipuram or normal hotels in kanchipuram, all have amazing hospitality. The term "nagareshu Kanchi" attributed the famous Sanskrit poet, Kalidasa, means that Kanchipuram was the best amongst the cities of India.Kanchipuram is one of the oldest cities in South India. It was during the reign of Pallavas, Kanchipuram attained limelight. The kings of Kanchi were great scholars. As regards learning, Kanchipuram stood second in glory only to Banaras. 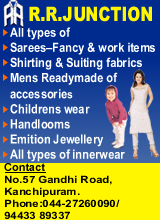 The history of Kanchi can be traced back to several centuries. Naga-worship is next to the Sri Vaigunda Perumal Temple in Kanchipuram. Kanchipuram was the capital of the Pallavas. Kanchipuram was a major seat of Tamil and Telugu learning as well as an important place of pilgrimage for Buddhists, Jains and Hindus. Kanchipuram in history was also been known as the ghatikasthanam or place of learning. Kanchipuram Sri krishna college of Arts and Science: This is also a one of the best college in Tamil Nadu. Bodhidharma went to China from Kanchipuram to spread Buddhism.He preached Buddhist ideologies. At that time he trained the local people in the art of Varmakkalai.The art underwent many changes and came to be known as Shaolin kung fu or boxing. In 1997, research indicated that the number of child laborers in the silk-weaving industry in the district of Kanchipuram exceeded 40,000. Working collaboratively, RIDE helped reduce the number of child laborers to less than 4,000 by 2007. In 2008, noted director, Priyadarshan, made Tamil film, Kanchivaram, about silk weavers' of the town, during in the post-independence period, it won the Best Film Award at the annual National Film Award. Kanchipuram is also the seat of the Kanchi mutt, a religious institution that became influential and famous under the leadership of Shri Chandrashekarendra Saraswati. This mutt says that Adi Shankara settled in Kanchipuram after establishing four Āmnāya maţhas in the four corners of India. Kanchipuram was a major Jain center. Hiuen Tsang was in Kanchipuram reported that he saw numerous Nirgranthas (Jain monks) at this place. Tirupantikundram village near Kanchipuram was a Jain center with the seat of a Bhattaraka. Kanchipuram is a major temple city of Tamil Nadu. Vishwakarma Brahmin Sthapathis have shown their excellent architecture cognizance in planning the architecture and sculpting the numerous temples at Kanchipuram. The list gives the consolidated list of temples in and around Kanchipuram. Kailasnatha Temple Ekambareswarar Temple Kachi Metrali Onakanthan Tali Kachi Anekatangapadam Kachi Nerikkaaraikkadu Kuranganilmuttam Tiru Maakaral Tiruvothur Panankattur Sangupani Vinayakar Temple Vazhakarutheeswarar Temple Thirumetrali Temple Satyanadeeswara Temple Adhi Kamakshi Temple Kanaka Durga Temple, Koneri Kuppam Thiruparruthikundram - Jaina Temple Politics Kanchipuram is a separate assembly constituency. In 2001, Kanchipuram had a population of 152,984. Males constitute 50% of the population and females 50%. Kanchipuram has an average literacy rate of 75%, higher than the national average of 59.5%: male literacy is 81%, and female literacy is 69%. In Kanchipuram, 10% of the population is under 6 years of age. Kanchipuram temples, were built in 1811.